Octopus is typical large family rides. Standard Octopus has 5 arms, 3/4 cockpits per arm, 2 seats each cockpits & 6 /8seats every arm and 30/40 seats in total. So it is totally fit for families, friends and lovers to have fun on holiday. 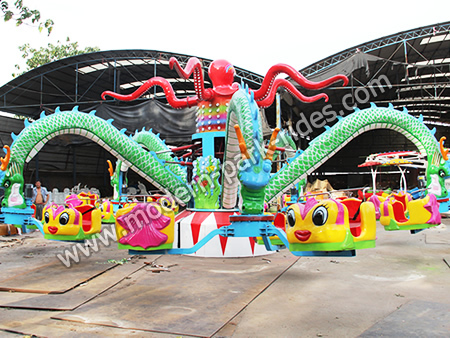 This ride regards sea as its theme, and combines octopus, dragon, fish with sea water together. Unique special design will attracts players deeply. When you enjoy this rides, you'll not only rotate along with the whole rides, but also revolve with another 2 cockpits installed on the same arm. Meanwhile, each cockpit can also go up and down freely, just make you feel like swimming in the sea with animals.